Harley Dee!!!! Harley Dee has a cute blog here: Koala Fuzz. I'd post pics of the "Random Number Generator" but my image editing software keeps crashing. I think I am better off going to bed early. After seeing that movie preview, my hands stated itching for clay. 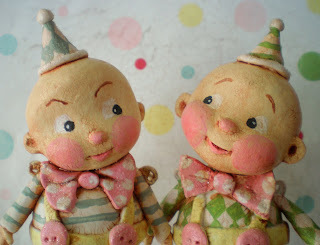 These guys are number 8 in the series of Storybook Dolls that I am offering on PFATT throughout 2009. 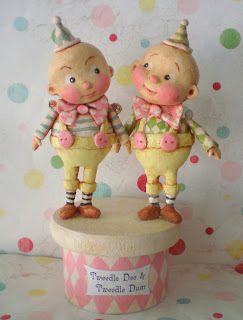 They were individually hand sculpted in paper clay and painted and finished with acrylic washes and glass glitter. They stand upon a harlequin painted wooden box (very fussy to paint that pattern, but worth it!). I think it looks like they are having a lively conversation. What do you think they are saying? Their hats indicate that they might be on the way to a party? Perhaps someone has invited them to tea? 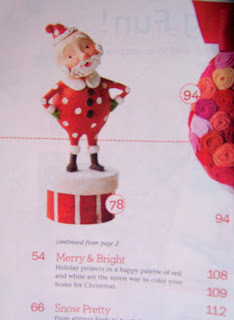 Thanks to all who left such sweet comments about the magazine feature. There's still time to enter the giveaway. I'll draw the winners tomorrow night and announce it on the blog on Tuesday. Happy Sunday!!!! 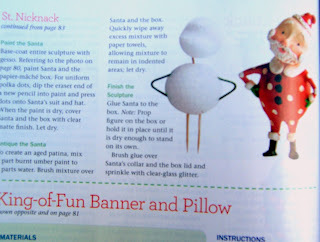 Better Homes and Gardens Holiday Crafts! Last March, the magazine's editor very kindly emailed me and asked me if I would be interested in submitting a project for their 2009 issue. Of course (dancing around and bouncing and shouting for joy) I said yes! And a few months later, there he is. A very sassy Santa indeed! And because all my fellow bloggers and blog readers have also been such a encouragement to me, the final copy I bought I'd like to offer as a giveaway! 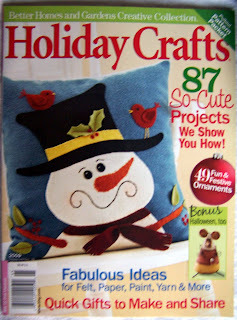 Simply leave a comment and share what your favorite holiday craft is. 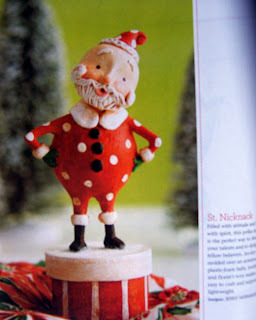 Do you make ornaments? Embroider? Handmade gifts? Gingerbread Houses? Winners will be drawn 1 week from tomorrow.